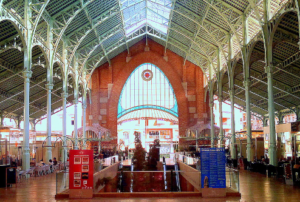 An impressive example of modern architecture of the early 20th century, declared a National Monument. 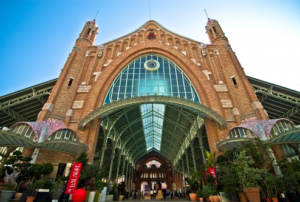 An impressive example of modern architecture of the early 20th century, declared a National Monument, Mercado de Colon is located in the former Fabrica de gas of Marqués de Campo and it has been inaugurated on New Year’s Eve in 1916. Located in the center of the city, about 4-5 minutes walk from the Colón metro station, this precious example of Valencian modernism reflects the ideology of the Valencian bourgeois society booming at that time. 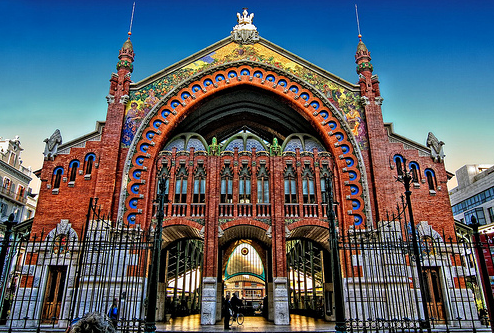 It was completely restored in 2003 and today it houses dozens of chic restaurants, shops, bars or cafes. It is the perfect place to have one of Valencia’s famous drinks such as refreshing Horchata.